The paper is focused on using the webcam as a 3D input device. Generally it means the user may use any object and shadow of this object to obtain the coordinates x, y and z (position in the space). 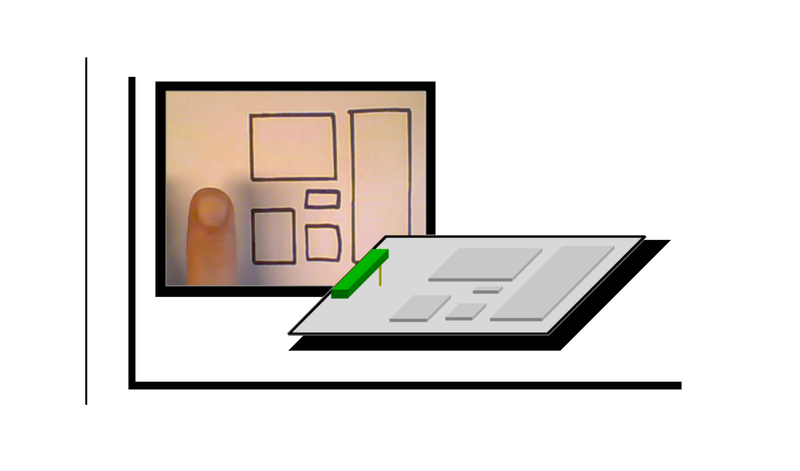 This idea allows to use a navigation in three dimensions without an expensive or atypical hardware. The system needs one ordinary webcam, an ordinary computer and a source of suitable light. The goal of this paper is to describe an implementation of a software usable for handling an input from webcam with conditions described previously. You can see that the image of the hand drawn keyboard is reversed. It is becaused of the position of the camera which is placed in front of the user. It seems like error but it is more natural to control the virtual keyboard from the user view rather than the oposite webcam view. The first step (it is not included in the video) is loading a picture of the hand drawn keyboard. There is used another image than in previous example because of variability. Then a clear background is shown. If the background contains another colours, the system may work wrong. The keyboard is memorized and shown in position window. There is the foreground in the foreground window.The object window contains the Io image and the shadow window contains the Is image. The white circles are current pivot points and the grey ones are the new pivot points. It will depend on calibration if the new pivot points are the current pivot points.